There’s a deal on amazon where you can buy Netrunner and get RFTG: Ambition free. 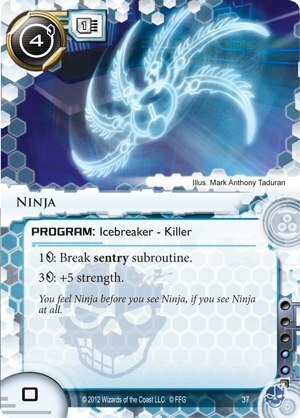 The deal stinks, but the art on ninja looks interesting. Googling that image brings up a few hits with that art, mostly reviews from the end of 2012 and early product listings for the core set. I guess that was the original art for Ninja that got sent out in the press pack with review kits before they sent off the final version to the printers for release? this has always been my guess as well. very few other killers made it from the base game. Codeslinger is likely the reference for Mimic (but imagine paying that install cost! Raptor could maybe ben the inspiration for Creeper, but that’s probably a stretch.